CAPITOL HILL: The US military spends too much time acting as the FAA of space and not enough watching for potential threats, the deputy chief of Strategic Command said today. 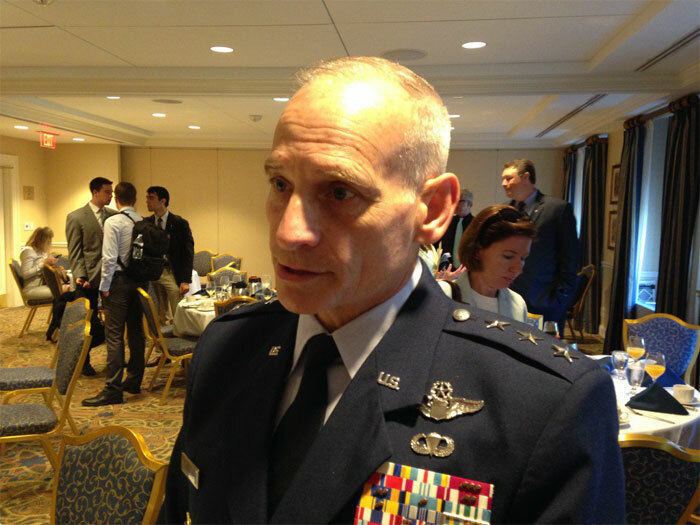 That has to change as outer space becomes increasingly contested and increasingly intertwined with cyberspace, Lt. Gen. James Kowalski told a Peter Huessy breakfast here. There isn’t a space equivalent of ICAO, the International Civil Aviation Organization, but maybe there should be, Kowalski told reporters after his public remarks. STRATCOM will absolutely continue doing that FAA-in-space mission as long as the nation requires, Kowalski emphasized. But, he warned, that’s time, effort, and manpower that will not be available for more military missions. Equally important, personnel who spend all day doing routine traffic management will have a hard time developing the right mindset to watch for rare but dangerous hostile acts. What are we worried about, exactly? Kowalski declined to detail the threat in an open forum, although he noted that Russia has claimed to have, and China has tested, anti-satellite weapons. Space assets also face a cybersecurity threat. Satellites are unmanned, after all, so they rely on software to function and wireless networks to connect them with their human masters on the ground. Cyber’s also more insidious than conventional weapons. It’s pretty clear when someone launches a rocket into space and blows a satellite apart — we’re still dealing with debris from China’s 2007 ASAT test, in fact — but there are far fewer clues to what happened or who did it in a cyber attack. Did a satellite glitch because the contractor wrote the software wrong, or because someone in China is inside your network, or someone in Russia is jamming your uplink? Even thinking to ask that question is still not second nature for US space operators, and answering it is harder still. For that matter, outer space and cyberspace are so complexly interconnected in our satellite-dependent society that no one really knows what a major attack would do. Kowalski believes the Chinese were taken aback by the sheer amount of debris their 2007 test created — and that was just a matter of physics, not effects rippling through a global network. “The implications of using force in those domains are not well understood and the second or third order effects of a decision to use force in space or cyberspace could rapidly escalate a conflict,” Kowalski warned. That prospect of escalation is particularly unnerving when you remember that the three states with the most advanced space and cyber weapons — Russia, China, and the US — also have good old-fashioned nukes. “We have to recognize that there are two authoritarian nuclear-armed regimes dominating the Eurasian landmass, and they are using or threatening to use a broad spectrum of force against their neighbors,” Kowalski said, from cyber attacks to China’s island-building to Putin’s Little Green Men. It would be great to have more international cooperation to make space peaceful and orderly, he said, but it’s hard enough to stop major powers from breaking the long-established rules of fair play down here on Earth, let alone get them to respect new rules in space.